The Me 209-II was a proposal for an enhanced version of the highly successful Bf 109 which served as the Luftwaffe's primary fighter throughout World War II. The Me 209-II, despite its designation, bore no relationship to the earlier Me 209. Messerschmitt's designation Me 209 was actually used for two separate projects during the late 1930s and early 1940s. The first Me 209 was a record-setting single-engine race plane for which little or no consideration was given to adaptation for combat. The second incarnation of the Me 209 project came in 1943 when Willy Messerschmitt proposed a heavily-modified version of his extremely successful but ageing Bf 109. This Me 209 would compete against Focke-Wulf's high performance Fw 190D-9 and Ta 152 fighters. Like these enhanced versions of Kurt Tank's design, the new Me 209 would share most of its airframe with a proven model, in this case, the Bf 109G. This marked a departure from the first failed Me 209 and later Me 309 projects which had been completely new designs. Unfortunately for the design team, the Me 209's proposed DB 603A engine was in short supply and they were forced to use the Jumo 213A engine which required some reconstruction of the engine cowling and cooling system. The Me 209 featured a new tail section, broad-track landing gear, a taller tail, and a Junkers Ju 88-style annular radiator for the inline engine, which gave the engine a superficial resemblance to a radial engine. 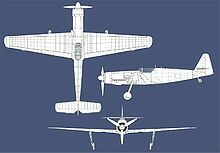 As with the original Me 209 project, however, successive modifications undermined the original purpose of the fighter, in this case to build a superior fighter as similar to the existing Bf 109G "Gustav" as possible. As the project progressed, increasingly cumbersome designations signalled the Me 209's evolution from a simple, enhanced version of the Bf 109 to a progressively incompatible airframe. The Me 209 V5 featured armament of one engine-mounted 30 mm (1.18 in) MK 108 cannons, and two 13 mm (.51 in) MG 131 machine guns in the wing roots. The V6 was the first version to be converted to use the Jumo 213 engine and had 20 mm MG 151/20 cannons instead of the MG 131. The Me 209H V1 was a high-altitude variant with extended wings and reverted to the DB 603. Despite this proliferation of variants however, the program met a swift end when the Me 209 V5 prototype first flew in late 1944. It was 50 km/h (31 mph) slower than the already-available Fw 190D and offered no improvement in handling characteristics. After its disappointing show, the Me 209 project was cancelled and with it ended Messerschmitt's last attempt to build a high-performance piston-engine fighter.